The midbrain (also known as the mesencephalon) is the most superior of the three regions of the brainstem. It acts as a conduit between the forebrain above and the pons and cerebellum below. 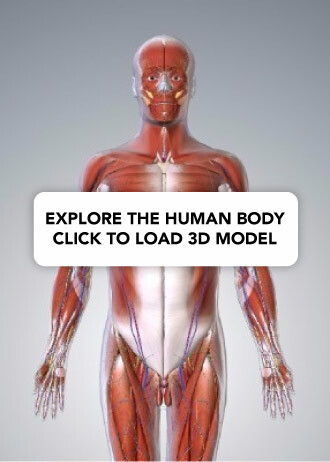 In this article, we will discuss the anatomy of the midbrain – its external anatomy, internal anatomy, and vasculature. The midbrain is the smallest of the three regions of the brainstem, measuring around 2cm in length. As it ascends, the midbrain travels through the opening in the tentorium cerebelli. Paired cerebral peduncles – located anteriorly and laterally. Internally, the cerebral peduncles are further separated by the substania nigra into the crus cerebri (anterior) and the tegmentum (posterior). The tectum houses four rounded prominences named colliculi (collectively the corpora quadrigemina) which sit directly inferior to the pineal gland. The colliculi are separated by the cruciform sulcus; there are two superior and two inferior colliculi. Superior quadrigeminal brachium forms a pathway between the superior colliculus and the retina of the eye. Inferior quadrigeminal brachium conveys fibres from the lateral lemniscus and inferior colliculus to the medial geniculate body. Inferior to the colliculi, the trochlear nerve (CN IV) emerges before sweeping across to the anterior surface. The paired cerebral peduncles extend from the cerebral hemispheres to converge as they meet the pons. They are separated anteriorly in the midline by the interpeduncular fossa, the floor of which is termed the posterior perforated substance (as many perforating blood vessels can be identified). 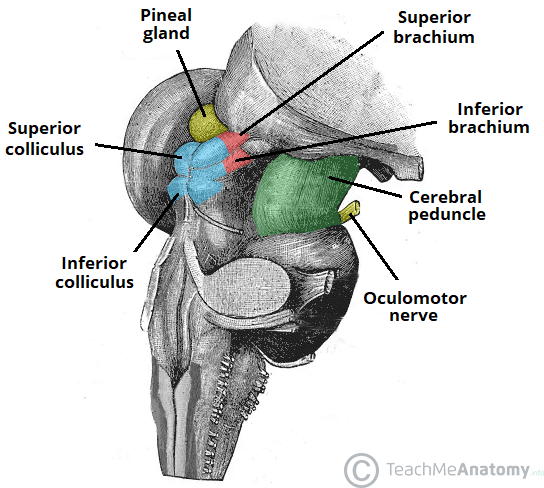 The oculomotor nerve (CNIII) is seen exiting from between the peduncles while the optic tract runs around the superior border of the midbrain. Fig 2 – Posterolateral view of the external anatomy of the midbrain. Two transverse sections of the midbrain will be discussed: the level of the inferior colliculus, and the level of the superior colliculus. Frontopontine fibres – located most medially. Corticospinal fibres – motor fibres from the primary motor cortex. Corticobulbar tracts – motor fibres from the primary motor cortex. Temporopontine fibres – located posterolaterally. Posteriorly is the substantia nigra – a pigmented nucleus that separates the two regions of the cerebral peduncles. It is further broken down into the pars reticulata (anterior) and pars compacta (posterior). The tegmentum is located posterior to the substantia nigra. It is continuous with that found in the pons by the same name. It is important to note that unlike the crus cerebri, the tegmentum is continuous at the midline. The cerebral aqueduct (see ventricles) is a midline structure surrounded by central gray matter – the periaqueductal gray matter. 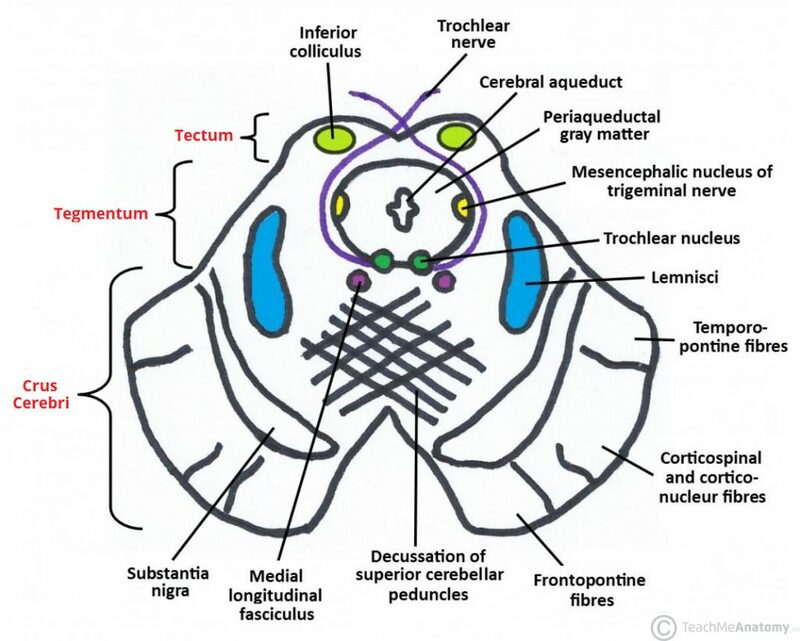 Within this gray matter lies the mesencephalic nucleus of the trigeminal nerve, as well as the trochlear nucleus with its fibres continuing around the gray matter to exit the midbrain. Anterior to this, the medial longitudinal fasciculus can be seen. The decussation of the superior cerebellar peduncles can be seen centrally at this level with some reticular formation (noted throughout the brainstem) lying lateral. Between the central gray matter and the substantia nigra are four lemnisci. Moving anterior to posterior they are the medial, spinal, trigeminal, and lateral leminisci. At the very posterior pole, we find the tectum which, at this level, contains the inferior colliculus. Figure 3 – Cross-section of the midbrain at the level of the inferior colliculi. NOTE: corticonuclear fibres are also known as corticobulbar. Much of the internal structure of the midbrain is unchanged at this level and should be assumed present unless mentioned below. The central portion which previously was occupied by the decussation of the superior cerebellar peduncles now contains the large paired red nuclei with some decussation of the rubrospinal tract occuring anterior to this. The reticular formation now fans around the posterior borders of the red nuclei. 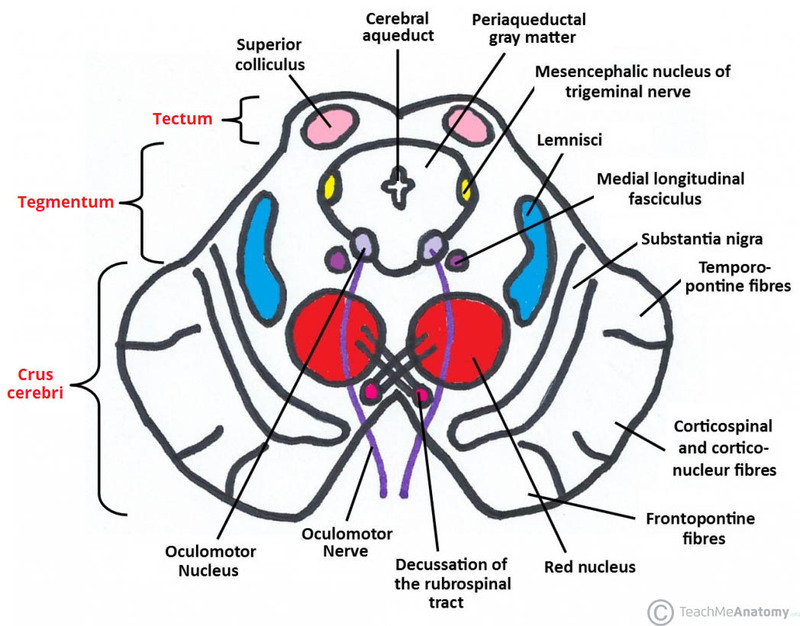 The trochlear nucleus is replaced with the oculomotor nucleus while the oculomotor nerve projects anteriorly. The medial, spinal and trigeminal lemnisci are all present in much the same location however the lateral lemnisci does not reach to this level. Needless to say, the tectum now contains the superior colliculi rather than the inferior colliculi. Figure 4 – Cross-section of midbrain at the level of the superior colliculus. We will only briefly look at the vasculature of the midbrain. The supply to the area is derived from the basilar artery and its branches. The major suppliers are: the posterior cerebral artery and its peduncular branch, the superior cerebellar artery, the posterior choroidal artery, and the interpeduncular branches of the basilar artery. Fig 5 – Vascular supply of the midbrain. The tectum of the midbrain houses four rounded prominences called colliculi. Where are they located in relation to the pineal gland? 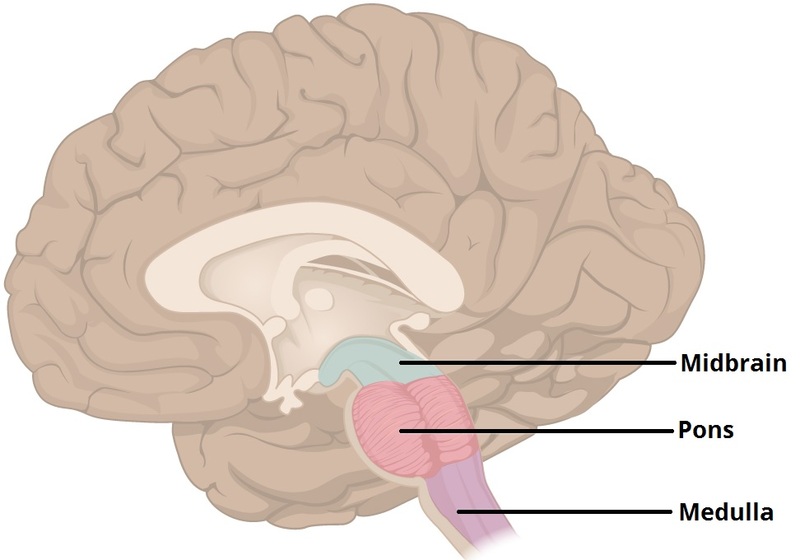 The colliculi of the midbrain are separated by which structure? The interpeduncular fossa separates which two structures?